Apply Oppression to enemies at target. + Apply Blowback (1 square) to enemies at target. A blacksmith Transient with an artificial right eye who hails from the land of Takamagahara. Adjacent to the Kamata Technical Junior College in Ohta Ward stands the remodeled practice workshop where he practically lives, as well as teaches practical skills courses. He watches over the Kamata Crafters, a guild in which many craftspeople who have lost a part of their body gather to strengthen their Sacred Artifacts. A veteran blacksmith, he calls out negligence an inattention with a gruff bellow. 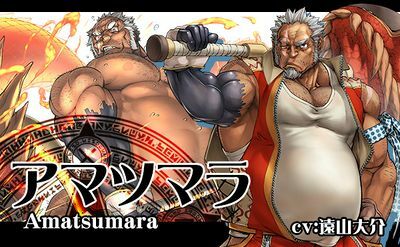 Amatsumara takes immense pride in being a swordsmith, and thus gets angry at those who misuse swords. A Transient smith with an artificial right eye who hails from the other world Takamagahara. He is partly settled as a teacher in the remodeled old town practice factory adjoining the Ota Ward Kamata National Institute of Technology. Among the Crafters where artisans who have lost parts of their bodies have gathered to strengthen Sacred Artifacts, his role is as a chaperone. 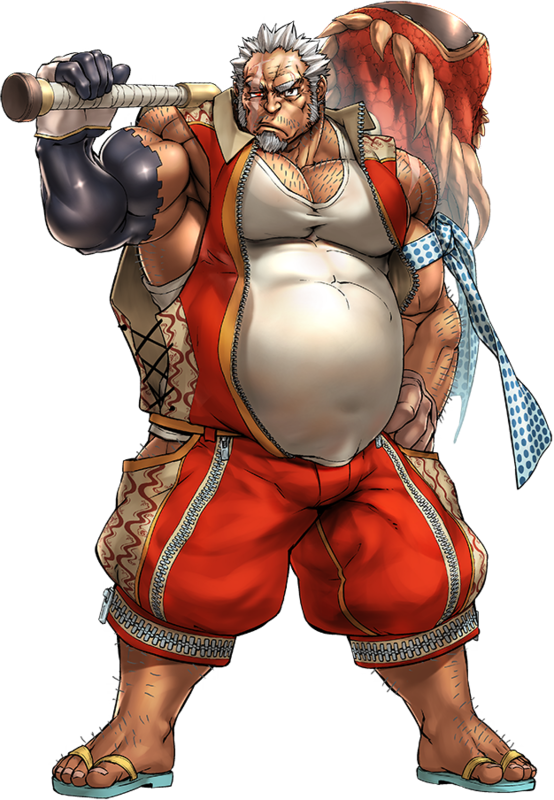 He's an experienced smithing teacher, shouting at the other guild members in a thick vulgar voice over their negligence and recklessness. He takes pride in having sword skills, so he gets angry when people don't treat them seriously. The hammer Sacred Artifact he shoulders is both a part of him and a storm calling dragon in itself. When the head enlarges to giant proportions, the mouth opens wide and creates a squall that blows away what it is aimed at without fail. He considers big things to be good, and when he swings around his seriously huge hammer, his motto is "art starts from tempered muscles." Students of his who join the Kamata guild are strictly attended to and treated as his own family, thought of as important, and strongly recommended to do muscle training. He's very attached to mirrors, and they say he pays special attention to his reflection. This guy looks like Granddad from Boondocks. Once you see it, you can't unsee. I want to see his fundoshi. I want that hammer. IT'S GODLY!!!!!! This page was last edited on 3 March 2019, at 23:04.